OUR nomadic ancestors had to quickly cover long distances while hunting. A prey that ran faster had to be outrun. While running after the animal they constantly moved their arms; it reduced the effort and counterbalanced the body weight. People now run after buses, sprinters run to win a medal. But the dynamics of running have not changed. What a team was interested in knowing was why humans swing their arms even while walking. The researchers from the University of Michigan, USA and Delft University of Technology, Netherlands, studied arm swinging that goes into a walk and concluded that it is an energy conservation measure. If humans do not swing their arms normally while walking, they will burn more energy. Health enthusiasts who take early morning walks in parks to lose some flab should change the way they swing their arms. The team developed a walking model to test its theory. Even with no force driving it, the model easily produced a walking gait similar to humans. When the model swung its arms in a way that opposed the normal mode of walk, it required muscular effort. 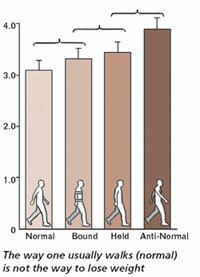 This proved that swinging arms normally while walking requires little muscular effort. Whether it yields energetic benefits or not the team found out next. Ten people were asked to walk in four ways: normally, arms clamped by the sides, arms held loosely by the sides and arms swinging anti-normally. In the anti-normal mode, the right arm moved with the right leg and vice-versa. Barring the normal swing, the body burnt energy in all the other modes. Metabolic rate was the lowest in the normal walk. It increased 7 per cent in bound condition, 12 per cent in the held position and was 26 per cent greater than normal in the anti-normal mode. "Swinging one's arms normally does indeed save energy. To get better exercise, one could swing them in the opposite direction. This is not the funniest way to burn calories," said Steven H Collins, key scientist of the study and from the Michigan University. "Our interest is in saving energy for patients with gait disorders who use too much energy as it is," he added. The study is in the August issue of Proceedings of the Royal Society B.